Los Angeles, CA – Electric Prunes fans are buzzing with excitement about the release of a new CD of unreleased live material titled ‘WaS’! Featuring 15 slamming cuts to keep you up at night! American psychedelic rock group The Electric Prunes first achieved international attention in the late 1960s. The band performed their 1966 hit song “I Had Too Much to Dream (Last Night)” on American Bandstand, and were also recognized for the song “Kyrie Eleison”, which was featured on the ‘Easy Rider’ soundtrack. After a period in which they had little control over their music, they disbanded for several years. 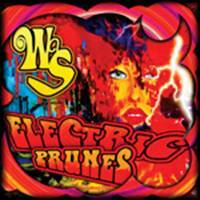 In 1999, much to the delight of their fans worldwide, The Electric Prunes reformed, and resumed recording and touring! “The Electric Prunes invite you, our closest friends, to a new adventure! WaS. That WaS the Electric Prunes! It has been a long journey here and we have waited till the planetary alignment was correct for a new release. The lunar eclipse signaled the start of something, tho no one is sure exactly what? We offer WaS as the saucer to fast forward you to the cosmic finish. There is a fine line between ‘IS’ and ‘WAS’. If what you did is more important than what you are doing, you WAS. One moment you is and then you was. Somehow 1967 doesn’t seem much different from today; tastes change but I think people are always on the lookout for some fresh ideas from the ‘is’ that makes them remember the ‘was’. Mark Tulin and I were collecting ideas and songs for our last adventure when he went through the door. I am not sure he is really gone because I hear his voice as clearly as if he were standing beside me. Usually, Mark and I would send each other song ideas back and forth until we had the rough story line and music in hand, then we would meet and pound everything into submission. This CD is a collection of those final ideas and messages between us and that is all we set out to present here; but a funny thing happened on the way to the recording studio. A new idea emerged behind a gig in Tokyo in an unusual snowstorm, and then someone sneezed on a girl in the subway, and a frozen winter chilled the planet; suddenly there were new thoughts, fresh ideas and new places to sketch our story in song. Everyone in the band felt it. Like a blast of energy. The ‘was’ became ‘is’. The 15-track CD features a throwback version of “Smokestack Lightning” from 2000 that was the band’s reunion call-to-arms with Ken Williams on lead guitar, Quint back up on drums, Mark Tulin on bass and an occasional harmonica by James Lowe. Original noise! There is also a live version of “Bullet Thru The Backseat” from a night in Bristol England featuring Williams, Lowe, Tulin, Dooley, more original fare. That leaves 13 original new songs to be explored. “Earwash” for the initiated!